Wondering how to ramp up your broadband speed? Our advice will help you get faster internet and avoid getting grumpy about slow downloads. There’s nothing worse than a slow-loading website, a download that takes forever or a video stream that keeps buffering. Uploading and downloading files, streaming video through sites such as Netflix and Lightbox, using video-calling apps such as Skype, putting photos and videos on social media sites, playing games, listening to music, or even sending an email with a few photos attached can take ages if your internet is slow. A confusing aspect of broadband is that the terms used to describe speed, frequency and size all sound similar. Here’s a quick guide to what they mean. Your internet speed is measured by the amount of information your device receives per second. Quantity of information is measured in bits, and internet speeds are in bits per second (bps). A bit is tiny, so the prefixes “giga” and “mega” are often used. Mega (M) means a million of something (106) and giga (G) is 1000 times bigger than that (109). They are used in the same way as kilo (103) is used in kilometre and kilogram. So a megabit (Mb) is a million bits, and 1Mbps is one megabit per second. This is where it gets confusing. Bytes are also used to measure information size (denoted with a capital B, so 25 megabytes is 25MB whereas 25 megabits is 25Mb). A byte is equal to eight bits. Bits are used when talking about speed, and bytes are used when talking about size. A music file may be 3MB in size, so if you downloaded that file at 3Mbps it would take you eight seconds (3MB = 24Mb, 24Mb at 3Mbps = 8 seconds). The last term used when talking about broadband, in particular WiFi, is Hertz (Hz). Hertz is a unit of frequency. Frequencies emitted by devices are clustered in bands because they can interfere with each other. For example, your home WiFi is in the gigahertz range (2.4GHz and 5GHz), while FM radio is in the megahertz range (between roughly 88 and 108MHz). If all you do online is light browsing – emailing, banking, checking Wikipedia and news sites – then the fastest you need is an average speed of about 40Mbps, for now. But that speed will be too slow in a few years. The average size of files you access online is increasing. Websites are getting more complex, with higher levels of interactivity and higher-resolution images. Software updates for devices are getting larger and streaming video is becoming more demanding, with ultra-high-definition content. 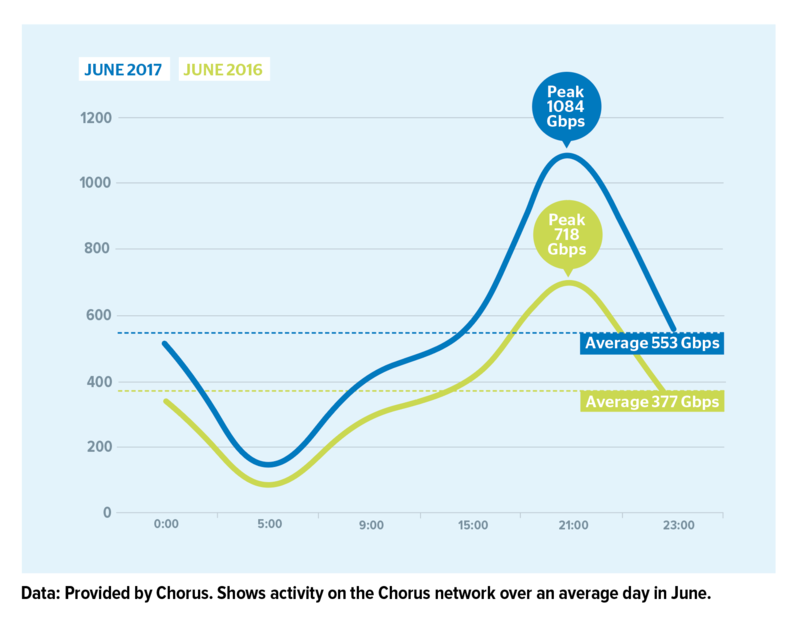 The chart below shows the data flow (uploads and downloads) on the Chorus network on an average day in June. In a year, usage over the day increased by 176Gbps to 553Gbps. You can also see what time everyone logs in to watch streaming video services. About 9pm, the country’s internet usage hits its peak, with 1084Gbps travelling across the network – an increase of 366Gbps from 2016. The total amount of data transferred on that day increased from four million GB to almost six million GB – a 50% increase. While that increase is spread over all users, the trend is clear: we’re using more data. The internet speed-testing site Ookla shows there is a trend for increasing average speed. Right now the average fixed broadband download speed is 64Mbps. In September last year it was 37Mbps. Much of this increase is due to consumers switching to fibre and VDSL, which give reliably faster speeds. So, it’s important to get the speed you’ll need for the future, not the speed you need right now. Your first step is picking the right broadband. If you can get fibre to your home, we recommend doing so. It offers the fastest and most consistent speeds and standard residential installations are free. People who sign up for 30, 50, 100 or 200Mbps plans get those speeds delivered to their home. On the flip side, VDSL and ADSL speeds are dependent on external factors, most notably your distance from the exchange. These plans are sold as “fastest-possible speed”. So, while you may get 70Mbps, your friend across town might only get 10Mbps. Most ADSL connections get between 7 and 22Mbps, whereas VDSL users get about 70Mbps (but there are those who experience a wide spread of slower speeds). ADSL or VDSL should only be considered if you can’t get fibre. Wellington and Christchurch users without access to fibre can also consider Vodafone’s cable network (Fibre X), which offers better speeds than A/VDSL. Rural users may find wireless broadband – sometimes called fixed wireless – which runs on the mobile network best for them. As rural properties tend to be far from an exchange, wireless can offer faster speeds than A/VDSL. Some internet service providers (ISPs) are selling wireless broadband to urban users. If you live in an area with fibre or VDSL, then don’t get wireless broadband. If all that’s available is ADSL, then talk to your ISP about expected speeds and reception quality. Before signing up to a broadband plan, check what options are available at your address. broadbandmap.nz shows which services are available at your address. It shows wireless and cable broadband as well as VDSL, ADSL and fibre options. askforbetter.co.nz, run by Chorus, gives you an estimate of the highest-possible speed at your address based on speed tests on the lines. It doesn’t include cable or wireless broadband. consumer.broadbandcompare.co.nz will help you choose which plan to go with. You’ve finally got the best broadband connection to your home and are looking forward to extreme speeds. However, if you aren’t careful with your home set-up then the speeds you get won’t be close to those you expected. While you may be getting 200Mbps down the line to your home, getting that over your WiFi network is difficult. This is due to how WiFi sends data. But the good news is, if you follow our steps, you’ll get extremely close. The main thing to remember is: future-proof. Just like when choosing what broadband to get, don’t set up a home network that’ll “do for now”. New tech is coming all the time and what works “for now” will be painfully slow in just a couple of years. A router is the device that creates your home network, using WiFi and/or cables. In this sense the router is your connection to the internet, but it also means it can be a bottleneck for internet speed. Think of it like water being piped into your home with excellent pressure, but it just dribbles out of the tap. You need a better tap for getting that water out. The first thing to know about routers is not all are created equal. The latest routers look like something Batman would use: all black, with sharp corners and covered in antennas. 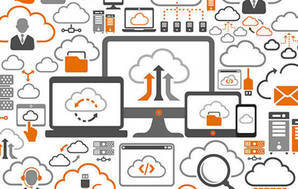 But most importantly, they will send data across your home network much faster because they use the latest technology. You may also need to update the software on both your router and your devices. Software updates not only patch security holes, but also fix bugs that can affect speeds. The best router in the world might not make any difference to the speed you get on an old laptop. That’s down to WiFi frequencies and WiFi standards. You may hear the term “beam-forming” used when talking about routers. Instead of sending out the WiFi signal in all directions, routers with beam-forming target connected devices. This beam forms a stronger connection to the device, allowing it to receive a good signal further from the router. Routers broadcast WiFi on two frequencies: 2.4GHz and 5GHz. The 2.4GHz band is the slower of the two, but is more powerful and can go through more walls. The 5GHz band offers much higher speeds but is weaker. The latest routers are “dual band”, meaning they broadcast two networks, one on each frequency. You’ll want the devices you use most often, such as your phones and anything that you use for streaming video, on the faster 5GHz network. Anything else, such as WiFi-enabled appliances, can sit on the slower 2.4GHz network. Routers and your devices communicate using different WiFi standards. WiFi standards come in b, g, n and ac (often written as 802.11 followed by the letters). The b and g standards are older and have been surpassed by n and ac. Nearly all modern devices use the n standard. It works on the 2.4GHz and 5GHz bands and has a potential top speed of 600Mbps. The ac standard isn’t in every device but will be found in most new tech, especially phones and tablets. The ac standard only works on 5GHz and has a potential top speed of 1Gbps. Standards are backwards-compatible, so if your router is 802.11ac, it will support devices using all previous standards. However, the maximum speed you’ll get is limited by the older standard. If you connect a tablet that supports ac to a network that only supports n, you’ll only get n-speeds and vice versa. If your old devices are still sluggish, the only fix might be to upgrade to something newer that supports a later WiFi standard and can process data faster. Don’t expect 2017 speeds on your 2007 laptop. Some routers are being released with the new ad standard (also called WiGig), which is broadcast on a 60GHz band and can run at much faster speeds (8Gbps). No devices yet support this standard. The first thing to do is find out what speed you’re getting. We recommend speed-testing websites speedtest.net and fast.com. Each uses a different technique for measuring the speed of your connection at a point in time, so using both will give you a better idea of what speeds your devices are actually getting on your network. You’ll get the fastest speeds when your device is connected via an Ethernet cable directly to your router. If you can, run a speed test on an Ethernet-connected device first and with no other device using the router, before testing over WiFi. All homes have WiFi dead spots – places where there isn’t any signal. There are several factors that can cause these dead spots, but they’re usually related to the strength of your router’s signal and how many walls, floors and other barriers the signal has to travel through. The materials used to construct your home can also stop WiFi signals dead in their tracks. Brick is a really good WiFi-stopper, as are thick wooden doors. You can use apps, such as WiFi SweetSpots, to find out how far your WiFi network reaches. Where you place your router in your home is one of the biggest decisions. Most of your devices will connect to the router wirelessly, so every barrier between them and your router will weaken the signal. Routers look nicer than they used to, but they’re still ugly. However, don’t be tempted to put yours in a cupboard. Having your router out in the open is much better for keeping the speed high. If you’re getting fibre, the installer will put an ONT (optical network terminal) in your home. The ONT is what you’ll plug your router into so, to get maximum coverage, plan on having both close to the centre of your home. Beware of the kitchen for your router as some microwaves work on the 2.4GHz frequency. This means reheating food can knock out your WiFi connection. If nothing else works you can use a WiFi extender to boost your WiFi signal and cover the dead spots. There are various kinds of extender – some can even send a signal via your electrical wiring – and they can be handy for extending your WiFi signal to the extremities of your home. We’ve covered all your options here. Sign up: Get the fastest plan that suits you. Signal: Make sure your router uses 5GHz WiFi, with 2.4GHz as a backup. Set-up: Put your router somewhere central and not hidden away. Software: Make sure all your devices (including the router) are up to date. “Caching” means overseas sites load faster and more efficiently – and that’s a good thing for everyone. Local caching is, essentially, keeping a copy of a website somewhere closer than where the actual site would be based normally. The closer the cache is to you physically, the faster the loading speeds will be. For example, Netflix keeps a cache of its entire service in various centres in New Zealand, run by ISPs. Google, Facebook, and YouTube all do the same thing. The partnership between the ISP and the website is mutually beneficial. The ISP gets to say, “this site will load quickly on our service” while the website partners with as many ISPs as it can so it doesn’t lose any customers. Latency is the bane of many internet users. Broadly it’s the time it takes for information from your computer to reach a server and then return. The lower the latency the better. It’s measured in microseconds these days but it can still cause issues. Think of it like this. Two users are playing a game online, both press the “shoot” button at the exact same time. The one whose computer has a lower latency (sending the shoot command to the server and then the game sending that information back out) gets their shot off first. Latency is why websites use caching. The closer you are to the server the lower your latency is. Also, fibre has a much lower latency as it sends signals using light. I note you don’t seem to cover this in your overview of wifi extenders. I have fibre on a 100 MBS/sec plan. My router was placed in the garage as the most convenient and appropriate place. That meant I needed a wifi extender. That lead to a slow and inconsistent service. I tried both a conventional and powerline extender. The speeds were between 10 and 20 MBS/sec(sometimes below). I recently purchased a mesh wifi unit ( Netgear Orbi RBK23). My speeds are now consistently 100Mbs (+ or - about 10). The cover throughout the house is much better and more consistent. I am delighted with the improvement. The issue we have with the internet is the line quality. The line from the exchange is very old and keeps failing once or twice a month. Chorus won't renew the line, probably because they're laying fibre in Tuakau so we have to call our ISP to get Chorus to reconnect us. Fortunately we use Voyager and their technical support staff are excellent. But it is very frustrating because the line seems to fail at the end of the week so over the weekend we can often be without internet. The connection failed on Thursday morning and was restored that day only to fail (i.e. speed of less than 1 mbps) Saturday morning. So Netflix has been unusable over the weekend. I keep asking them and they keep saying "it's coming". Meanwhile we get about 4Mbp from the ADSL box that we are 2km from. Much better gear than consumer "hedgehogs"
I'm loving that for home use, people are waking up to the topology of a dedicated separate router to a switch to dedicated AP(s), instead of the feature-poor, overpriced ugly "hedgehogs" sprouting antennae, otherwise known as consumer all-in-one devices. I got my brother a Ubiquiti ER-X (~$100) into a unifi AC-LR ($180) to replace his hopeless ISP-supplied Fritzbox. He's over the moon because after months of frustration, wifi disconnections and fruitless calls to his ISP, he's finally got reliable, decent UFB internet around his 2 story house. I can't recommended getting business/enterprise gear highly enough. It's now so cheap, and with a bit of know how from the internet is a robust solution for even your grandma. I disagree with your characterisation of the Fritz!Box being hopeless: I have found them a fantastically capable unit .. at most things. I will admit that their Wi-Fi strength isn't stellar. I have obtained a Meraki AP for use at my place and the better Wi-Fi unit plus better placement has meant we now have far better Wi-Fi coverage than what we got from the Fritx!Box. Apologies for the error — we've now applied superscripts. Thanks for pointing this out! That's all very well. We signed up to Vodafone's "up to 200mbps plan" and consistently get 75 to a top of 80 on their Cable/fibrex. I don't believe they ever intended to to provide what their vague advertising suggests. I recently switched from DSL to fibre and find it great. Note that with the Dual Band Wifi Routers, devices may switch to the lower freq/slower mode as the signal is stronger, so I set my devices to only connect to the 5GHz. It pays to take note of the comment of distance from the exchange. Despite being shown I can obtain VDSL I have been informed differently that only ADSL is applicable and low speed tests and distance from the exchange do apply.